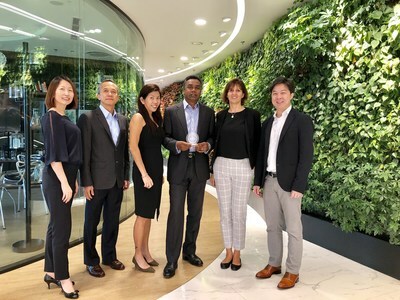 GENEVA, Jan. 28, 2019 /PRNewswire/ -- Firmenich Singapore, an affiliate of the world's largest privately-owned perfume and taste company, today announced it is the only company in Singapore to be certified as a gender equality employer by EDGE. With this endorsement, Economic Dividends for Gender Equality (EDGE), the leading business certification standard for gender equality, is officially recognizing Firmenich Singapore for driving a diverse and inclusive workforce. Worldwide, Firmenich is one of only seven companies to be globally certified as a gender equality employer, with Singapore standing out for its inclusive culture and career advancement opportunities for all. "I am very proud that Firmenich Singapore is the only company in Singapore to be EDGE certified for our commitment to gender parity. With women representing 60% of our management positions we are well beyond the national median of 38%," said Lourds Rajan Arul, General Manager of Firmenich Singapore. "This outstanding recognition not only positions us as an employer of choice for the men and women who work at Firmenich Singapore, it also makes us a trusted and reliable partner for our customers, as diverse teams deliver superior results." "We congratulate Firmenich Singapore on being the first in its industry to earn EDGE Certification," commented Aniela Unguresan, Co-founder of EDGE Certified Foundation. "Firmenich scored exceptionally well in the areas of inclusive culture and career advancement. Particularly notable was the high share of women in the workforce and in management positions, as compared to their industry peers." Firmenich Singapore emerged from the rigorous assessment as an employer clearly dedicated to gender equality, with policies in place for pay equity, an inclusive company culture, and high ratings from its colleagues on equal hiring opportunities. Notably, the Singapore affiliate systematically requires gender diverse candidate pools for all management positions. Advancing its commitment to diversity and inclusion, Firmenich Singapore collaborates with the Singapore Association of the Visually Handicapped to enable professional opportunities for its visually impaired graduates, recruiting them as "sensory panelists" to assess flavors and fragrances. Recognized as an outstanding international company, in 2018 the affiliate received the Singapore Business Review International Business Award for this innovative program. Firmenich Singapore also won SwissCham's 2017 inaugural award for Excellence in People and Skills Development for its dedication to talent development, notably the quality of its trainings, as well as its strong partnerships with local universities, including the National University of Singapore and Nanyang Technological University.